The view is the thing. Wait till you see the spectacular 180 degree lake view on this architecturally perfect 4 bedroom, 3.5 bathroom custom home with vaulted ceilings, 3 fireplaces, pantry, den/library, full laundry room with deep sink, rockin' master suite with double walk-in closets, spa, fireplace, kitchenette w/fridge, 2-50 gal water heaters, 2 forced air units, complete fire suppression system, security alarm system, intercom system, storage loft (mirrored wardrobe), extensive redwood decking w/ win The view is the thing. Wait till you see the spectacular 180 degree lake view on this architecturally perfect 4 bedroom, 3.5 bathroom custom home with vaulted ceilings, 3 fireplaces, pantry, den/library, full laundry room with deep sink, rockin' master suite with double walk-in closets, spa, fireplace, kitchenette w/fridge, 2-50 gal water heaters, 2 forced air units, complete fire suppression system, security alarm system, intercom system, storage loft (mirrored wardrobe), extensive redwood decking w/ wind protection, 2 car attached garages, timed irrigation systems, fenced dog run area and single 1,000 sq. 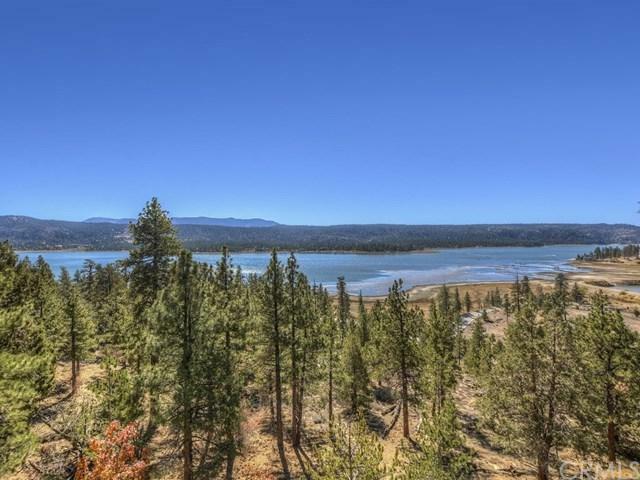 ft. sub-area w/ room to expand all w/ the best views in the Big Bear Valley.